Almighty God, every good thing comes from you. Fill our hearts with love for you, increase our faith, and by your constant care protect the good you have given us. We ask this through our Lord Jesus Christ, your Son, who lives and reigns with you and the Holy Spirit, one God, for ever and ever. Amen. Then he said to the host who invited him, "When you hold a lunch or a dinner, do not invite your friends or your brothers or your relatives or your wealthy neighbors, in case they may invite you back and you have repayment. 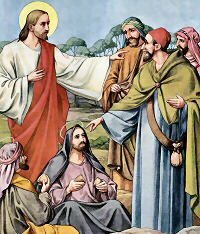 Rather, when you hold a banquet, invite the poor, the crippled, the lame, the blind; blessed indeed will you be because of their inability to repay you. For you will be repaid at the resurrection of the righteous." The first reading is taken from the Book of Sirach 3:17-18, 20:28-29. In today's reading we have a few more of the words of wisdom on humility from this saintly man who spent his life meditating on the law of God revealed to the Chosen People. The second reading is from St. Paul to the Hebrews 12:18-19, 22-24, in which he contrasts two scenes. One is the giving of the Old Covenant and the other the assembly of those justified by the New Covenant. The reason why the Church has selected these verses is the same reason that St. Paul had when he wrote them. He wanted to impress on the Jewish converts the superiority of the Christian religion over that of the Old Testament, which they had practiced until their conversion. The Gospel is from St. Luke 14:1, 7-14 in which Jesus had been invited to dine in the house of a leading Pharisee. The Pharisees were so convinced of their own perfect knowledge and observance of the law, that they thought nobody else could possibly know it or observe it as perfectly as they did. In a very simple parable Jesus told them where their pride would lead them. A proud Christian, that is, a proud follower of the humble Christ, is a contradiction in terms. Christ, the Son of God, lowered himself to our level when he took our human nature. He was born in a stable, reared in the obscure village of Nazareth; earned his meager meals as a country carpenter; died on a cross as a malefactor with two thieves as companions; was buried in a God's banquet. Thank God, there are few whose pride leads them to these extremes, but there are far too many who set themselves up as judges over their neighbor and appoint themselves as the models to be imitated by all others. There is a little demon of pride in every one of us. There is a natural inclination in each one to esteem himself a little better in most ways, if not in all, than his neighbor. We must keep this demon in check and not let him grow in us. Any gifts of mind or body that we have are from God — our duty is to use them properly and to thank God for the loan of them. If he gave greater gifts to another, I thank God for it. That other was able to make better use of them than I would. I have enough to go on with. I shall not be judged on the use or abuse of gifts which I did not receive. If I use all the gifts which God gave me, to help my neighbor, the spiritually poor, the lame and blind, to heaven, instead of keeping myself aloof from them as the Pharisees did, then my judgment will be easy. I shall be "repaid in the resurrection of the just." The proud Christian sets himself up as a critic of God's wisdom. He muses: God forgives sinners too easily. God doesn't know them as well as I do. That conversion cannot be trusted, it will not last, he says. The "sinners" prosper, they are blessed with good health, a happy family, more than their share of the world's goods, and here am I who never failed God, who always did what was right and even more, and I am neglected by God. God doesn't know his real friends! These are the questionings of a proud soul. Such Christians raise themselves above their neighbors in their own minds. They choose the first places, and from their self-appointed heights they look down on their fellow guests at stranger's grave. Could he have done more to induce us to listen to his counsel when he said: "Learn of me, for I am humble of heart?" Yet, there are Christians who are proud. Like the Pharisees of old, they thank God that they are not like the rest of men. They shun any contact with sinners. They cover their ears when any scandal is mentioned. Yet they never miss the gossip, and are always ready to condemn offhand the unfortunate giver of scandal, without knowing the extenuating circumstances. — Excerpted from The Sunday Readings Cycle C, Fr. Kevin O' Sullivan, O.F.M.